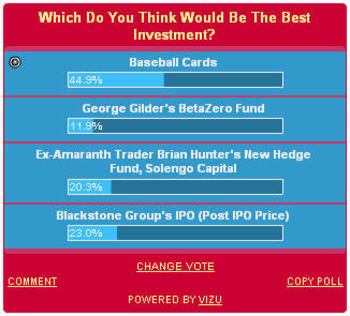 After hearing that George Gilder and Brian Hunter would be starting new hedge funds and the Blackstone Group would be going public, we asked Ticker Sense readers which would be the best investment. Our readers are not too optimistic for any of the three. A couple weeks worth of voting resulted in baseball cards getting the most amount of votes by a pretty wide margin. Maybe we should start up Pitcher Sense.